This was my carry along project when I went to Chicago for Renegade Craft Market. You know, in case I got bored. HA HA! Yes. The poor little thing has been sitting in a ziplock bag for more then a month now. Finally, finished. The fabrics are mostly heathery and soft. The bird is a blue-grey piece of cashmere fabric that I dyed a while back. I got the owls back from the Hoot! Show at the Renegade Spotlight Gallery and they are now in my Etsy Shop.Â And yes, I am working on a pattern. No promises for how long though… since I am afraid to open Photoshop and InDesign… once I get over that hurdle, things might proceed more rapidly. the other 2 projects I brought to NY. I thought they were finished on Monday night. So smug. I didn’t get around to photographing them until late on Tuesday afternoon. As I was looking at them through the camera, I started to know they weren’t quite right. The photos confirmed it. Back they went to my desk. They both had some rework and now I am happier. The first face had eyebrows but the poor baby looks so unhappy! And a little Frida Kahlo too. Can you see the difference? I restitched the face onto the doll. 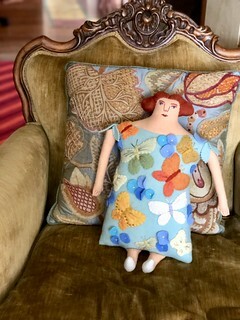 People are often surprised to find out that I usually stuff my dolls before doing the embroidery. I didn’t stuff these babies first because they were traveling with me. This face was stitched onto the doll when I stuffed it. The main baby fabric stretched when I stuffed it but the wool felt of the face didn’t. The stitches got pulled and Frankenstein-ish. Now I am happier. The gray-blue fabric is woven cashmere that I dyed. I am not sure what color dye I was working with, but when it came out, I wasn’t thrilled and threw it into the pile of fabric to be redyed. Every time I went through the pile, it would catch my eye and I’d think about it then put it back. One day though, it followed me up to my studio and after the moonbeam girls, this baby needed to be made. I spent several hours yesterday cleaning and sorting out piles in my studio. Wool is now mostly put away and time for toile and tattoos. I am working diligently to have a good selection of work for Renegade. It is one month from today- YIKES!Â Anyway, look- open flat spaces in my studio! Well, not anymore, but I did document it while it lasted. I’m not really sure why, but red is the color of this past week. Red and green- my favorite color combination. 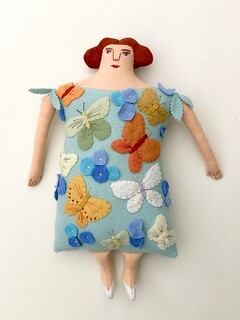 This lady (like the last baby) is inspired by some quilt applique photos that I’ve got in my notebooks of inspiration. I used thin strips of wool felt for the lines- something I’ve never tried before. Stitching was just not showing up on the textured black and white background. Woohoo- I am going to New York City on Thursday/Friday. And probably Portland, ME on Wednesday to pick up Peter. Yep, life is speeding up around here. I’ve been getting a lot of questions about what inspires me- well, this does! Jan’s post about her trip to the Chicago Quilt Fest is full of wonderful inspiration and be sure to check out the flickr set that she put together. So much deliciousness! Her “night” is shades of purple and navy. Moonbeam 1 is all blues. Her pinafore- this is the best color when I look at the photo on my computer. It is cashmere on cashmere applique. She wasn’t done when I went and checked on her yesterday- I took off a capelet I’d make- she didn’t need it. And, I had forgotten to do some finish work on the skirt- it was still pinned on. But finally, here she is! There is a dearth of finished projects around here, although I have made a great leap forward with my Kitty pattern. I spent yesterday working on the computer with a friend helping me out.Â Another few days of that and I might have something to show for it! Salley sent me some photos from her upcoming book and I asked her if I could post them. Here are the details- It is called POCKETFUL OF POSIES: A Treasury of Nursery Rhymes. Publisher, Houghton Mifflin Harcourt. Available, Sept. 2010. I love the beautiful leaf designs- they are often in my head when I work on a tiny world. I LOVE this one! The baby, the tree, the walnut shell! Swoon! Here is the cover- although Salley tells me that the actual cover photo will be much better. And, here is the drawing for the cover. So interesting to see the idea and how it comes together. Thanks for the preview Salley! Here are some other photos of her work.